Italian Art Pottery - Bitossi, Bagni, Rosenthal-Netter. My first post here, and thanks for the add. I have two pieces. At first, I thought the Owl Jar was Bitossi because he did so many owls. Something wasn't right about that guess, and then I thought it could be Bagni. My question on the owl, could this be Bagni while he was at Bitossi? 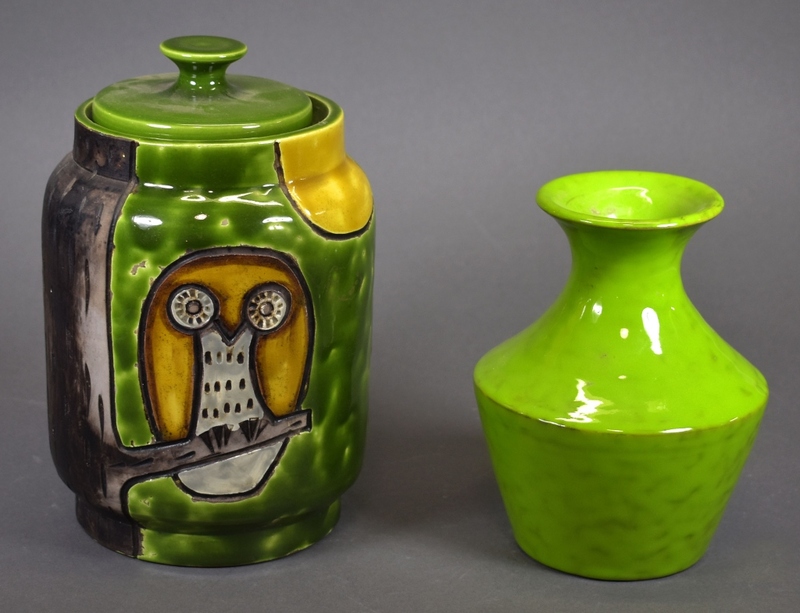 The green vase (6") has a Rosenthal-Netter sticker on the bottom. Can you attribute this piece? I can't read the numbers on either piece. Thanks so much. Any help appreciated. Re: Italian Art Pottery - Bitossi, Bagni, Rosenthal-Netter. Thank you, touchdry. I did find both of those items earlier. I really wanted to confirm that it is, in fact, Bagni Bitossi. There is a lot of misinformation out there. I apologize, but I see the bottom photo did not show up again. Let's try it this way. "This way" did not work. I was trying to insert an image from Flickr. Sorry. It would be either Bagni or Bitossi. eBay Sellers add Bitossi to get extra views but the style of the piece and the code number looks like a Bagni one.